What Is a IATA-Compliant Dog Crate? A IATA-compliant dog crate is an airline-approved carrier specifically designed for air travel. Unlike regular dog crates, the International Air Transport Association imposes a set of feature that are required for pets to travel in both short and long-haul flights. Such measures are taken to ensure the safety and comfort of the pets throughout the flight, while also making it easy for the airline crew to attend each traveling pet’s needs. Regardless of your dog’s size, from a small Pomeranian to a Giant Schnauzer, airlines around the world will require your crate to follow some clear guidelines so the airline staff can monitor and care for your dog throughout the flight, whether it is a 2-hour domestic trip, or a 12-hour transcontinental journey. Commercial airlines approve IATA dog crates only to ensure the maximum safety of your four-legged passengers while travelling. Rules and guidelines enforced by IATA over traveling pets and air travel crates force manufacturers into adding some features, and removing others. 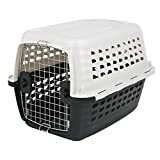 Some airline companies also sell their own dog crates and carriers, but I highly recommend you to give your trust to an actual pet brand rather than an airline when it comes to buying high-quality air travel crates for dogs. Airline-approved kennels for dogs are built to remain stable during takeoff and landing, to offer maximum ventilation, easy visibility for the stewards and stewardess, and so on. If you have already flown your dog, you know how stressful it is, and we keep thinking how bad the journey must be for our pets in the hold. Some airlines may be more lenient while others tend to be much stricter than what IATA requires in its official document. Always check with your actual airline to confirm if they have any additional requirement. International flights are generally more restrictive than domestic ones. Now, several crates that are made available at stores and online have water and food bowls and come with a metal door. These are not to be mistaken for being airline approved dog crates. So, how do you know if the crate is actually an IATA compliant one? Here is a list of rules/specifications as dictated by the International Air Travel Association that must be followed with respect to being an airline-approved dog crate. As a basic requirement, IATA demands that the crate should be tall enough so that the dog’s ears don’t touch the top of the kennel while standing. There is a thumb rule with respect to the ideal size of a crate, applicable for both domestic as well as international travel. 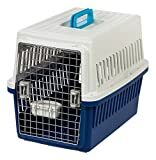 That is, the crates must be the pet’s length + half their leg and a travel crate must provide them with considerable space in both the front and the back. While traveling by air, your dog should be able to turn around and lie down without difficulty inside the crate, without seeking help from any crew member. Make sure that the nuts and bolts of your favorite airline pet crate are made of metal and not plastic. This is an obvious decision, simply because metal promises strength and durability and hence, the safety of your dog in the event of strong turbulences. However, some IATA dog crates have metal bolts covered in plastic caps, which are allowed by most airlines without a problem. As for the door, virtually all airlines demand that it should be in a single whole metal piece instead of cheaply made plastic folds. A metal door is robust and therefore, makes it impossible for the dog to pull the door in, or collapse it. Additionally, metal doors generally come as grids which offers a much better ventilation. It is inevitable for a dog to get hungry and thirsty during travels. For this, airplane crates are required to have two separate food and water dishes, ideally made of stainless steel. These travel food and water dishes must be attached to the crate door itself so that the airlines representative is able to access the dishes without having to open the kennel door. Thus, your dog will be fed properly without the risk of them moving out of the crate. Dog owners are required to put down all the feeding instructions of their dogs on the crate along with a bag of food. While the airlines handlers will feed your dog, they must know about your pet’s food habits, allergies, intolerances, etc. to be sure of what they are going to feed him/her. Also, prefer dry dog food to avoid moisture that would result in a lot of peeing. If there are very specific problems that you know your dog is susceptible to have when flying or traveling, check with your vet some any sort of light medication to make the whole journey easier on them. As an owner travelling with your pet by air, you must include your pet’s vital information right on top of the crate. The basic information should contain your dog’s name, your contact number, flight number, final destination, your address and the contact information of someone at the final destination. The pet documents will ensure quick recovery of your dog should there be an unforeseen circumstance where you are unable to find your dog. Just like bags loaded in the wrong plane, it may happen that your crate gets loaded in the wrong plane mistakenly. Having all these seemingly obvious details clearly displayed atop may spare you stress you do not need. Ventilation is one of the top concerns of owners when it comes to making their dogs travel in crates by air. This is because we have never been in a plane’s hold, and it cannot be very great to stay there for hours, alone, in the dark. Our imagination makes it come across very stuffy, and it surely is. Consequently, a IATA dog crate should have air holes on all the four sides of the crate, at least halfway on each side of the crate. For domestic flights, on the other hand, the crate needs to have two vent sides apart from the door. Having said that, it is always advisable to buy crates with vent on all four sides as optimal airflow and pet safety are of primary importance for your dog. As per IATA guidelines, a dog travel carrier must have a lining with cushions and absorbent papers. These are meant to save your dog from getting injured in potential accidents during the travel. And obviously, they will serve as pee pads since little accidents are often happening during such stressful conditions for dogs. Air travels are undoubtedly anxiogenic for the dog; they end up alone in a random dark place that vibrates a lot by surprise. However, when carried in a comfortable crate that abides by all the mentioned guidelines for their safety, the journey might actually turn out to be trouble-free and quite enjoyable, both for the dog and the owner. Top Opening Doors — A IATA compliant dog crate should not have any top opening door; indeed, any kennel with doors at the top will be refused by a majority of airline companies. There can be enough openings and air holes at the side for the purpose of providing maximum ventilation to your dog. However, a top opening door is risky as a restless dog might find his/her way out of the crate and get hurt in the process. Plastic Doors — Metal nuts and bolts are a must in any airline-approved pet crate. Travel kennels cannot simply have plastic doors or plastic side latches that are too weak to hold the top and bottom of the carrier together. The metal nuts and bolts can, however, have a plastic cover, which does not reduce its strength in any way. In fact, many airlines require the kennel door to be entirely made of up a single piece of metal for enhanced safety and security, but this is a preference rather than a requirement.. Wheels — The IATA approved pet crates can have detachable wheels but not the usual, normal wheels. The advantage of detachable wheels is that these can be removed so the crate has no chance of moving, unless it is carried. If the crate has no detachable wheels, make sure that it has no wheels at all. Wheeled travel crates in a plane’s hold would end up rolling around, making the dog sick. Soft Crates — Soft-sided crates are perfect for your dog when you take them for a walk or a short journey in your car. However, when it comes to air travel, the crate cannot and should not be made of any sort of unstable materials like wire mesh, as per the guidelines laid down by IATA. The softer the fabric, the riskier will it be for your dog. Durability and strength are the must-have features of an airline dog crate as it must protect your dog and keep him/her safe under any circumstances and uncalled for situations. The domestic travel airlines are often a bit relaxed with respect to following guidelines applicable for dog crates. However, it is always advisable to abide by the official international guidelines to ensure that your furry family member enjoys the air travel and faces no problem whatsoever. With so many airlines approved pet crates available out there, it is but natural to be confused and spoilt for a choice. However, each one accompanies its unique features, advantages and some downsides. Following is a list of the top 5 IATA-compliant pet crates for air travel that are worth checking out. The Petmate Sky Kennel is one of the most preferred dog air travel crate that abides by all of the IATA airline requirements. It is also rated positively by thousands of people across various websites. Available in six different sizes, all are built to offer ample space for your dog to comfortably stand up, turn around and lie down too. This crate comes with distinguishing features that make it stand out among many other travel carriers. About 25% of this crate is made of durable recycled materials and you have these pre-drilled zip tie holes that are strong enough to keep the kennel door tightly shut. The cable ties are also quick release and hence, highly recommended. There is one single metal door, which again is quite robust, preventing your dog from pulling the door inwards by force. 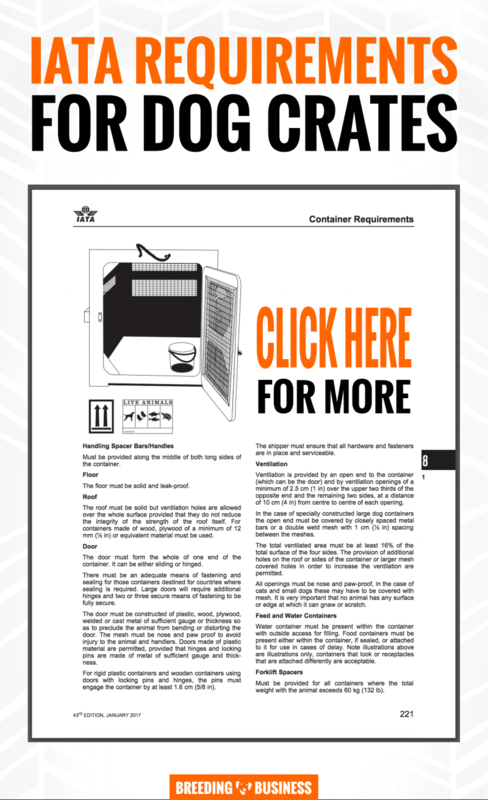 The presence of “live animal” stickers and air holes on all four sides for maximum ventilation further makes it IATA compliant. The Petmate Sky Kennel also has protruding handles or rims on the sides and the manufacturers did this to follow the rim spacing requirement of the airlines. The kennel contains two attachable food and water dishes that can be clipped to the kennel door and are accessible by the handler without having to open the entire door. An additional safe lock is yet another prominent feature of this IATA compliant dog crate. While most crates have two pins to lock into the top and bottom of the kennel, this one has a vault style locking system where four pins are used in all the four sides of the crate, thereby, promising enhanced confinement. The Petmate Sky Kennel is possibly the closest to what an official airline approved dog crate should be. 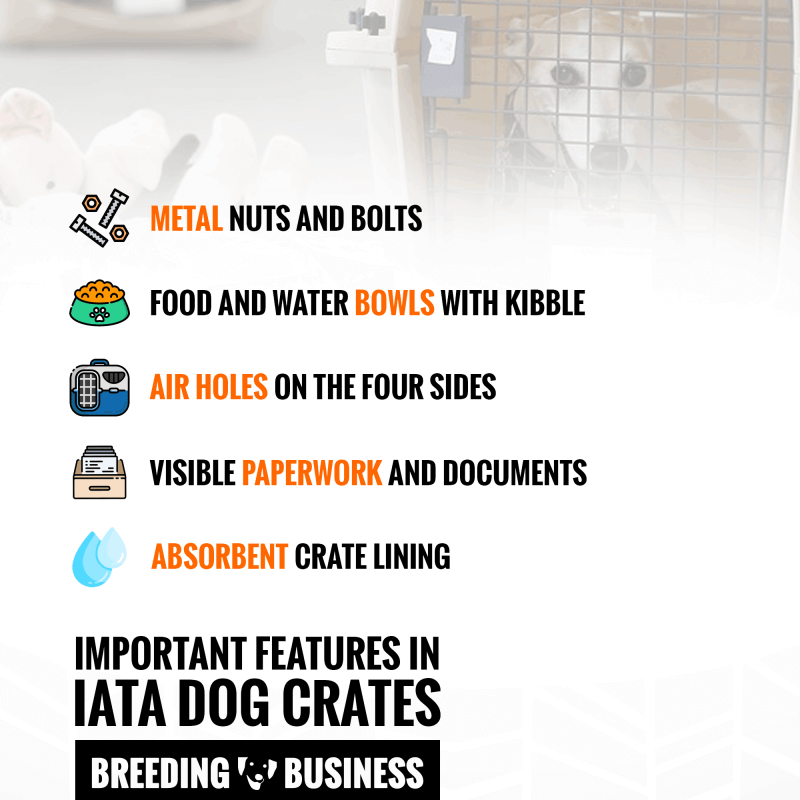 However, there is one downside and that is, it comes with plastic nuts and bolts while the perfect IATA compliant dog crate must have metal nuts and bolts. However, if this crate appears suitable in all other respects, you can buy metal nuts and bolts and replace the plastic ones. The crate, as such, is easy to assemble and transport. Since, it’s an overall good buy and also value for money, owners who are frequent travellers are recommended to buy this one for sure. 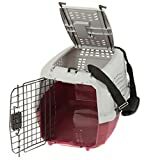 The Petmate Compass Plastic Kennel is a very popular airline crate with a capacity of dogs weighing up to 20 lbs and about 11″ and 19″ inches in height and length respectively. Easy to assemble without any tools, this crate comes with 360 degree ventilation on both top and bottom, therefore, ensuring maximum comfort for your furry family member. It also comes with an oversized doorway to promise easy entry in and out of the kennel. The Petmate Compass Kennel is spacious enough to offer airy home containment for your pet. With 360-degree ventilation, there is remarkable outdoor view too. The crate is made of extremely durable polypropylene and has features conceived to guarantee enough security for your pooch on all types of flights. Further, there are two pet-proof rotary door locks and door safeguard bars to maximize your dog’s safety quotient. In any emergency situation or location, the chrome door automatically opens to either side as rarely done in most products. However, the crate might seem to be a little difficult to assemble. Also, it is not too preferred for bigger, more restless dogs. In fact, a 58 pound dog might seem too heavy for this as the locks appear comparatively weaker and show signs of coming off rather easily. Overall, this IATA compliant dog travel crate is loved by most dogs, thanks to its space and openness. It is one of the best products that offer a good value for money too. Go for this one if you have a small or medium dog and prefer the Petmate Sky Kennel if you have a larger or more restless dog. The IRIS Deluxe Pet Travel Carrier is available in three sizes (extra small, small and medium) and two colors (navy and red.) This model is entirely designed keeping in consideration the demands and requirements of a dog during a long air travel. As such, the cage has enough air holes and is amply ventilated. There is a relatively small food and water dish attached to the door. Interestingly, the carrier also allows you to use a door padlock as an additional safety measure to ensure that your dog is safely contained at all times. This particular model of IATA compliant pet crate is perfect for specific breeds like Chihuahua, Yorkshire Terrier and Toy Poodle. An airline approved crate, apart from having all the necessary features, must also be easy to use and hassle-free to transport and store. The one-handed latch operation of the IRIS Deluxe Pet Travel Carrier guarantees this with much conviction. As required by most airlines, this crate has several nuts and bolts securing the top and the bottom part of it. The carrier offers a blend of safety and comfort for your pooch with its sturdiness as well as enough room for your dog to stand, turn around and lie down without difficulty. However, this crate has a few downsides too and most of these are related to the make of it. Some dog owners with heavier and bigger dogs might find it too small to be comfortable for their pet. The wire metal door might seem to be a little weak to be able to sustain if your dog has chewing tendencies. The plastic around the side vent is also relatively thinner, making it even more vulnerable to wear and tear. Overall, the IRIS Deluxe Pet Travel Carrier seems to be a good buy for those with smaller, calmer dogs. If you are not a frequent traveller, you can easily go for this as it will offer you good value for money and enough durability. But, if your dog is aggressive, has chewing tendencies and you need to take him to places by air often, this model is not the recommended one. The Favourite Airline-Approved Pet Carrier comes in only one size (23″L X 1.5″W X 13.5″H) and accommodates pets weighing up to 25lb (i.e. small dogs.) It’s also available in two colors: blue or red. 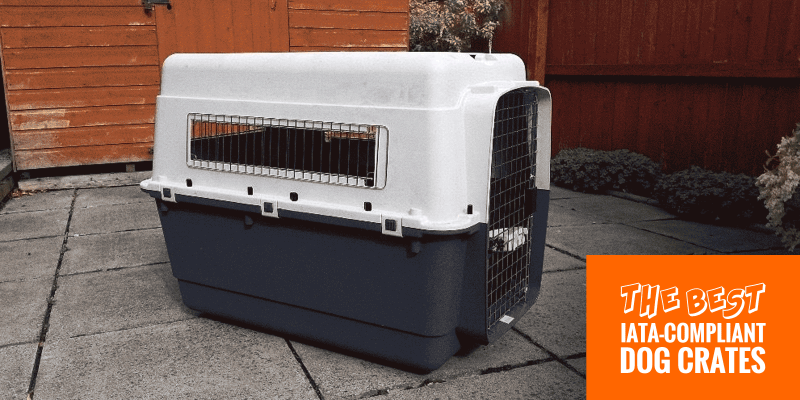 This particular IATA compliant dog crate has a very eye-catchy stylish design, making it a smart looking pet crate. Dog owners who have an eye for detail and want everything that belongs to your dog to be attractive, this one is an ideal choice. 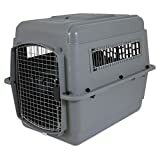 This cheap IATA carrier comes with two doors, including a top-loader allowing easy placement of your dog inside the crate. However, remember that some airlines do not accept top-loading travel crates, though! This is a great product for domestic flights and small dogs. The Favorite Pet Carrier is made of high-impact plastic that is not only strong enough for protection but also easy to clean. As such, with proper maintenance, this crate can function without wear and tear for a longer period of time than most other crates in the same category. The manufacturers have paid utmost attention to the ventilation aspect, which continues to be an important concern when it comes to taking your dog by air. There is an extended side rail, which works well in preventing the carrier from sitting flat against the wall and blocking the air circulation as a result. This particular model is very popular among small dog and toy breed owners because of its compactness, look and appeal. With practically no downsides worth mentioning, the Favorite Airline-Approved Pet Carrier, in fact, scores over many others by virtue of its two main characteristics. One, it can be easily assembled without external tools and second is that, it offers you with a relatively economical way of ensuring that your pet travels safely and in comfort always. If you need a top-loading travel crate for your small dog, this is the one for you. The Suncast Deluxe Pet Carrier is a decent good value portable pet carrier, especially created for air travel. The manufacturers have carefully incorporated features that make this crate meet the airline standards. The built is robust, which promises durability and superior performance for a long time. The wire and resin construction is also pretty strong for a crate of such specifications and price. The Suncast Deluxe Pet Carrier has a food and water tray attached to the door, making it easy for you to keep your dog fed, no matter how long a distance you are travelling. The easy-access storage compartments add to its overall ease of use. The sides of this crate are vented, which makes sure that there is enough air circulation inside the kennel to keep your dog comfortable and happy. One of the most interesting and stand out features of this kennel is that you can put your dog’s name with letters that are included in the crate, thus, making it more personalized. This pet carrier, which is ideal for both car and air travel, can accommodate dogs up to 17.5″ inches tall. For now, this is the only size available (which is odd since all other products offer several different dimensions for customers to choose from.) Another downside of this crate is that it might initially appear to be a little difficult to set up. However, once you have figured that out, the Suncast Deluxe Pet Carrier can turn out to be one of the most comfortable carriers for your little dog. Read the official IATA requirements for containers of traveling pets. Airline dog crates will come in various sizes and several distinguishing features. Like in case of all other types of accessories, buying an air travel dog crate, too, requires understanding what suits best for your dog. While some varieties are perfect for certain breeds of dogs, the same products might be totally unsuitable for others. So, while buying one, understand the IATA compliance requirements, your dog’s special needs and the crate features in order to strike the right deal.